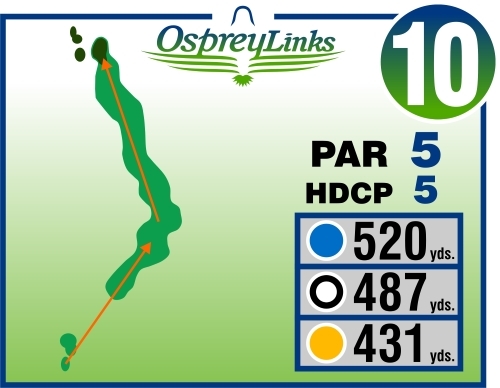 Welcome to the Tenth Tee and enjoy this par five featuring a slight dog leg left. From the tee, there is a slight uphill elevation, straight away, so go ahead, hit the driver, but hit it straight as woods grab errant shots on both the left and right. From the top of the rise, you are still over 250 yards from the green so hit what you need, but again accuracy is required as woods await errant shots to the left, and some extreme rough to the right. Most of us will be hitting a wedge into a large green for our third shot.